Nice Day for a… White Widow. The Golden Age of Islam. Sorry, had a tech-fart yesterday and couldn’t work out how the new WordPress editor worked when linking to Facebook – it doesn’t, at least not very well. Could be just old age on my part, of course? 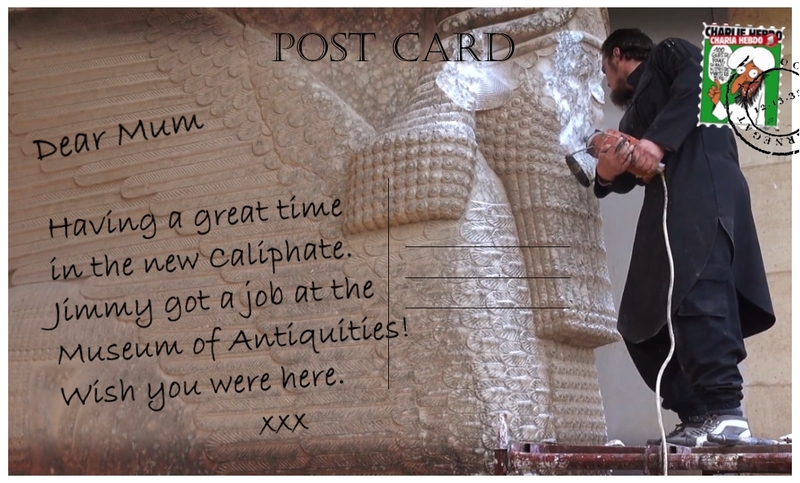 Apologies to the people who ‘liked’ it on Facebook but were then deleted along with the photo – yes, it was me who deleted you – not the Caliphate Technical Department. Don’t worry, I think all their skills lean towards video production and photoshop workshops at the moment? Mind you, credit where credit is due, they’ve done a great job on ‘Jihadi John’ – and that’s not just down to technical prowess, lighting, makeup etc. A good management team is worth a million virgins as far as I’m concerned. Still, good management aside, John ought to be careful to not become a victim of his own success. He is huge now, granted. The Donny Osmond / John Bishop of his day. The Poster Boy of Islamism. How many young pre-pubescent Jihadi’s – male and female, swoon at the sight of those dark North London eyes. But to paraphrase John Lennon – where coincidentally he gets his stage name from; he’s now bigger than Allah – and here lies John’s problem… at some point someone in the Caliphate production hierarchy is going to start thinking ‘Idolatry‘ – and that’s not good. Certainly not for John’s career. It’s hardly a new phenomena. Both Karl Marx and Max Weber warned us years ago regarding the dangers of the Cult of Personality, especially it’s tendency to divinisation under totalitarian States as they attempt to control the media. Just look at what happened to ‘Uncle Joe’. Yes, he may well become a victim of his own success. If I were John I’d be feeling a little hot and sweaty around the collar. Don’t feel embarrassed, John, we’ve all done it. Besides, fame is a fickle mistress. Cast your mind back to September 2013 and the victorious and strategic al Shabaat attack on the Kenyan Shopping Mall. British Muslim Samantha Lewthwaite – widow of 7/7 bomber Germaine Lindsey, apparently (if our media are to be believed) led and masterminded that glorious attack on unarmed shoppers and their small children. Headlines invoked an image of this ruthless ‘White Widow‘ – an altogether grander monicker than the comparatively bland ‘Jihadi John‘, I might add. But where is she now, John? Not even chip-paper. Hell, even Seal Team Six get more column inches than the great martyr Bin Laden – and they’re supposed to be anonymous. My advice would be to get out whilst the going is good – or at least start thinking about a future without fame – it could happen; It’s not just Samantha… look at Rolf Harris, or Keith Chegwin. What if this Caliphate thing doesn’t work out? What if the bubble bursts? What if the gigs stop coming in? Have you anything to fall back on? Can you do a bit of plumbing or painting & decorating? Are those presenting skills transferable? I’m not thinking Blue Peter here, John – I think that option’s just about gone, to be honest – but I hear Teaching English as a Foreign Language is in big demand in the Middle East. Sorry, I know, it’s hardly the bright lights… sorry, just a thought, John. I’d hate you to think I was trying to poo poo your success – there’s enough of that in the industry as it is. No, I merely want to point out the pitfalls of a fickle career choice where people rarely think about things like Equity membership or Personal Pension Plans. Knife; Knife sharpener; Ninja Pyjamas; Eyeliner etc’. Don’t be late though, John. The buggers just done me for a hundred quid. Ps: Top Tax Tip: If you let them see your mouth on the videos you can claim for toothpaste!